This year, we did something a little different for our getaway trip: a bike tour in Hawaii. Based on the recommendation of one of Allen’s colleagues, we selected a company called Backroads for the excursion. Backroads offers cycling trips around the world. The company has more than 500 tour leaders, and has been in existence for decades. From the moment Allen and I joined their Big Island, Hawaii bike tour, we were impressed by the company’s professionalism and attention to detail. Trust me, not all tour companies are created equal. I’ve learned that the hard way. When our tour group met in our hotel lobby, we were greeted by our main Backroads tour leaders, Haven and Josh. Both young, high-energy guys, they paid attention to our every need the entire experience. There were about 16 other participants in our group – all of whom later proved to be pretty strong cyclists. Our first day consisted of introductions. The tour leaders later surprised us with a playlist based upon the answers to one of the icebreaker questions: “What was your first or favorite concert?” We then boarded the Backroads vans with our bikes on top. (Backroads provided all the bikes, based upon our specifications, which we provided well in advance.) Our tour began at a local coffee farm. While we were walking the grounds of the farm, our hardworking guides, readied our bikes. They also set up a snack table and jokingly explained the nickname of their company was “Snackroads.” We certainly did not go hungry at any time during the tour. We were well fed with high-quality snacks and dining experiences. Haven and Josh proclaimed that their goal was that none of us went back home with a net weight loss. I’m pretty sure the leaders met their goal. I have never been so well nourished! Our first ride from the coffee farm was a short, but steep, 10-mile descent to the beach. As soon as the ride started, I realized this was not a tour for a novice. Traffic was constant – even heavy at times – and the shoulder on the road was extremely narrow. The elevation changes on all of our rides were significant. I would consider the Big Island to be mountainous, and we experienced some rides with a significant amount of ascent. After stopping for an upscale picnic lunch set out by our Backroads leaders, we continued on with our ride – this time testing our climbing skills. We climbed 2,100 feet in the last 15 miles of the day. The second day of the trip was my personal worst. But that discontentment really had nothing to do with that day’s ride. Allen and I discovered early that morning that we had booked our flight home one day after our trip ended. We are both normally very detailed – an error like this has never happened to us before, so naturally we were both dismayed. This won’t come as a surprise to anyone who knows me, but instead of being relaxed and enjoy the day ahead in the tropical paradise, I spent every down moment on the phone, trying to change our flights. We didn’t get our travel plans resolved until that evening. So, with that on my mind, it was hard for me to enjoy the rides of Day 2. To make matters worse, I dropped my phone while making one of these calls, completely shattering the bottom portion of my screen. The rides on Day 2 were difficult too. We climbed about 3,100 feet in 45 miles, traveling from the coast of the Big Island up to the Volcano National Park – our home for the next two nights. Our third day of the tour started with a 5-mile hike through Volcano National Park. Our group was expertly led through a lava tube and then down to the bottom of a vast crater. The black volcanic surface of the crater, gave us the sensation of being on the moon – beautiful and eerie. After another delicious lunch, we took off on a 37-mile ride through the park. The views on this ride were stunning, as we climbed some of Hawaii’s active volcanoes – a ride consisting of 2,500 feet of ascent. That evening, our group was treated to one of my favorite dining experiences of the trip. (And that is saying a lot since Backroads made a big effort to make sure we were well fueled.) We ate dinner within the park, at The Rim. This restaurant had an extraordinary view of the volcanic activity – the bright red glow of the lava lit up the black night sky, enhancing our dining experience. As the trip progressed, I began to be more at ease with the traffic on the Big Island. I became more confident in my riding skills. 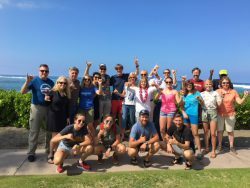 I had come to know my fellow participants and leaders a little better, and I was beginning to really enjoy my bike ride around the Big Island. The fourth day of the trip consisted of an 80-mile ride from the Volcano National Park, through Hilo, and down to the Kona Coast. This was my favorite ride of the week. This ride had a total ascent of 2,300 feet on a variety of roads: from highly traveled highways to desolate back roads. With just one full day left in the trip, I was finally getting into the groove! Day 4’s ride also ended at what may possibly be one of my all time favorite hotels: the Fairmont Orchid. The tropical landscape truly looked like paradise – especially to a worn-out cyclist. There was not much downtime in our Backroads itinerary, but I relished this one evening on our own at the Fairmont. It was a treat to have a nice dinner on the beach with just Allen. Though I enjoyed the upscale boot camp type environment of our trip, I was craving a little bit of relaxation time. There is no better place to relax than the stunning Fairmont Orchid. The next day, Day 5, proved to be my most personally satisfying one. I completed 73.2 miles on the “tough portion” of the Kona Ironman course. Our route included some additional off-course hill climbing to an overlook with a view that was well worth the extra effort. Not only was the total ascent of 3,500 feet a challenge on this course, but also the wind resistance made this ride exceptionally tough. I was thankful to have the support of my Backroads leaders on this ride. With the temperature in the 80s and full sun, I needed all the hydration and snacks I could get. As a group, we were all starting to bond too. There was a lot of encouragement that day that helped us all get through the challenging but rewarding day. But, alas, all good things must come to an end, and the end of our trip was on Day 6. After a very early morning kayak ride to view the sunrise, Allen and I headed out on a run. I enjoyed every minute of this run, knowing in a matter of hours I would be on my way back to the brutal cold January winter weather in Indiana. I think Allen and I were both questioning our decision to pay to change our flights to leave early. That extra day of relaxation may have been both worth it. Like always though, we were also excited to get home. As much as we enjoyed the warmth and beauty of Hawaii, the physical challenge of the trip, the hospitality of our awesome tour leaders, and the camaraderie of our fellow participants, we were eager to return to Indiana – snow and all. No trip or destination could be more exciting than the simple act of hugging our kids after being away for a week. 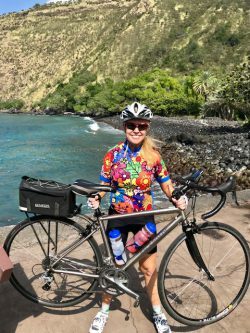 If You Give a Mom a Bike will probably never be a sequel to If You Give a Mom a Marathon, but the bike trip was certainly a great experience worth writing about – thanks to the beauty of Hawaii and the professionalism of the Backroads tour company. I highly recommend them. If you give a mom a bike and a six-day trip to Hawaii, she will be a happy camper. I mean cyclist. My oldest daughter, Kelsey, even mentioned that I seemed “different after my trip to Hawaii.” I am certainly a little less stressed and possibly a little better on the bike. Mahalo (thank you) to Haven, Josh, Casey, and Lee of Backroads, and of course, special thanks to my husband, Allen. This was a trip I will always remember. 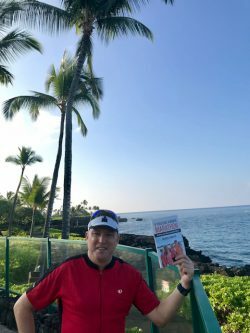 I even got Allen to pose in a few places around Hawaii with a copy of the book. Thanks for sharing the details of the trip. I always enjoy hearing of and/or reading about your adventures. I love this idea of getting away as a couple too. Very nice review. But could Marcia do it? We stayed at the Orchid msny years ago. It was nice. Marcia could definitely do this. Each day, different mileage options are offered. You can ride as little or as much as you want.